This poster is a flight of fancy from the collection created by the late Nigel Mantzel – 24 Hour Technicolor Dream, probably created in the 1980’s advertises an International Times benefit gig that almost definitely never happened but had a stellar line-up featuring Pink Floyd, The Who, Frank Zappa, Velvet Underground and John Lennon. He often created posters for events that had long since past, or were just wishful thinking on his part. 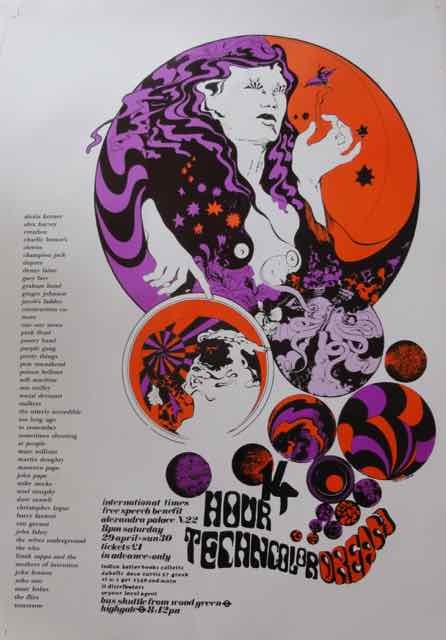 This poster is one of those – 24 hour technicolor dream, probably created in the 1980’s advertises an International Times benefit gig that almost definitely never happened but had a stellar line-up featuring Pink Floyd, The Who, Frank Zappa, Velvet Underground and John Lennon.